Once again, we partnered with Miami Book Fair to highlight the childrens’, teens’ & tweens’ programming, which includes author book signing, games and even free books! In “Miami Book Fair 2017 Young Adult Readers Series” we are celebrating the authors who will be presenting their books for young adult readers in Miami during Nov 12-19th. Learn about their inspiration for the book, what they like most about participating in the fair, when to see them at the fair…and more! Here we celebrate author Kim Dwinnell, an illustrator/animator/graphic novelist who also teaches classes at California State University Long Beach. Dwinell likes stories more than the beach. Almost. Maybe it’s a tie. 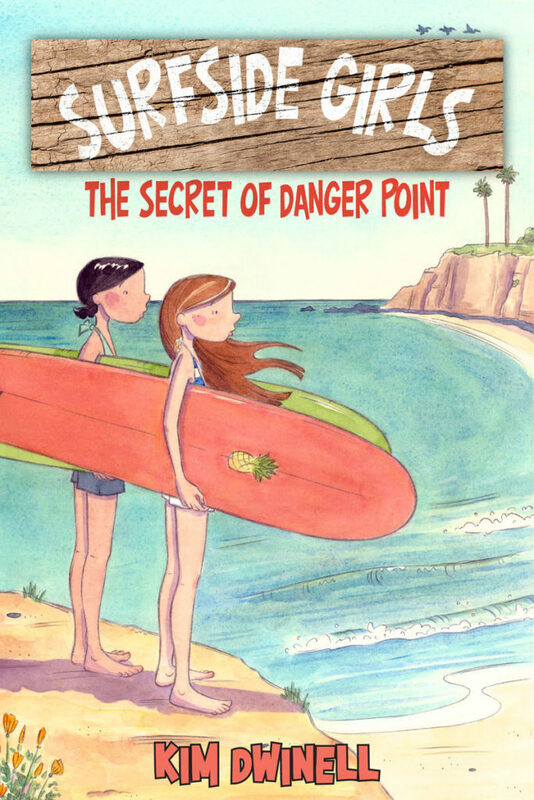 She first had a career as a beach lifeguard, and then a career in animation (The Swan Princess, Cats Don’t Dance, Hercules, Mulan and Tarzan) and now combines her two loves in her first graphic novel, Surfside Girls: The Secret of Danger Point (Top Shelf Productions). Things are getting weird in Surfside for Samantha. After swimming through a secret underwater cave, Sam starts to see things. Like ghosts. And pirates. And maybe something even scarier! Can she and her friend Jade get to the bottom of this mystery in time to save their town? 1. 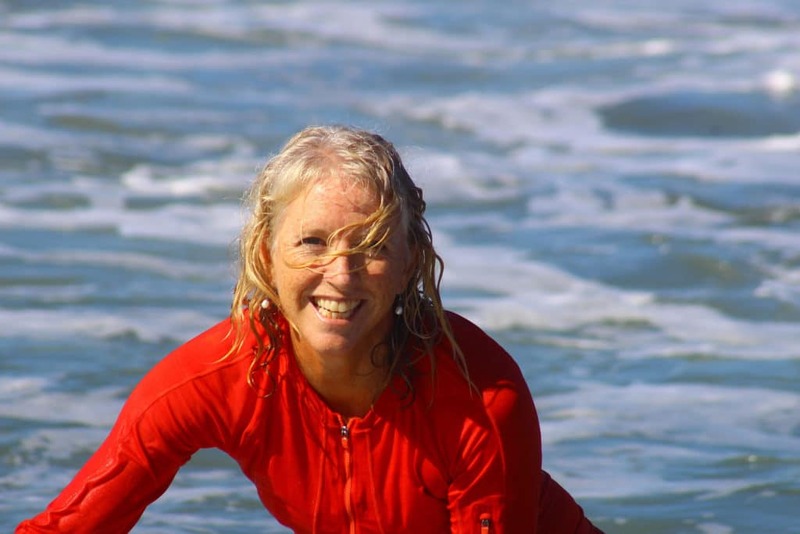 What was the inspiration for writing your new book, Surfside Girls? As a girl, I loved Nancy Drew and always wished I would find a clue that led to a mystery, or a trap door under a rug! I also watched Scooby Doo- more mysteries- and loved the show Flipper. If I couldn’t be Nancy, maybe I could have a boat and a pet dolphin. In my grown-up years I’ve spent a lot of time in the ocean- as a surfer, a beach lifeguard, and now I’ve added kayaking and boating to my list. I’m super inspired by the ocean- it’s definitely my happy place. 2. What do you want your young readers to take away? Speaking especially to young girls, I want to inspire them to get out into nature, explore, and be athletic. Junior Lifeguards is a great place to learn about how strong you are and how awesome you can be. If the ocean isn’t your thing, how about the forest? Or rock climbing? Getting out in nature and pushing your limits teaches you a ton about yourself. On a different note, I hope my book inspires people to be a good friend, and to respect and take care of that nature that surrounds you. 3. How did you started writing books for young people? What is it you like the most about writing for them? I think everyone who writes has an age that their voice comes from, and my writing voice is definitely from middle school. There is nothing like the intensity of feelings in middle school- the strongest friendships, the most insecurities, and those new feelings about boys! What a wonderful time to be a human! 4. What is your advice to young writers about getting published? First of all, just do it! Once you write something, you’re a writer! That’s not hard! If you like comics, make little Xerox copies of your mini comics and sell them for a quarter to your friends. Then make more! Another thing is to write what you know. I am really familiar with the ocean, so that is a major character in my books. Everyone has a story- whether you have a string of really embarrassing moments (I’d love to hear about them! ), or maybe you are good at kickboxing, or you raise rabbits. The secret is knowing what excites you, and sharing that with people. 5. What do you enjoy the most about participating at the Miami Book Fair? What are you looking forward the most this year? I have never been to Miami, and all I know about it is from TV. It looks like a REALLY FUN PLACE! The flavor of the town, the architecture, the colors, and the fact that it’s near the ocean make it really exciting to me. Plus, the Book Fair is a big party, in this fun city, centered around books! Does it get any better? I can’t wait! This will definitely be a highlight of my year. When to catch Kim at the 2017 Miami Book Fair? Don’t Miss our Drink & Draw at The Standard! For the second year, Miami Book Fair pits famed comics authors/illustrators against each other in a one-on-one battle for the title of Drink & Draw Champ! Join host Conor McCreery and some of the world’s leading comics creators including George O’Connor, Kim Dwinell, Tillie Walden, and Matt Holm for a bout that will teach McGregor and Mayweather what a good fight is really all about. It’s summertime. 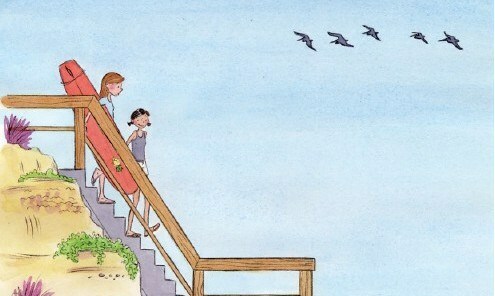 And that means sun, friends and surfing—until a swim through an underwater cave leads to ghosts and pirates! Get to the bottom of a spooky mystery in Surfside Girls. This entry was posted in For Teens, Parenting Teens, Raising Tweens and tagged books for teens, books for tweens, Miami Book Fair. Bookmark the permalink.